Facilitated by Prateek Panwar. Annual bird count teaches local children about birds & conservation. SWD donates money to help program. What SWD loves about this program is that Prateek pairs up children in local villages with the trained birdwatchers so they can learn about birds. It is an inspiring and unique program that deserves recognition. Bird watchers from all corners of India and overseas along with 800+ rural youth participate to generate a avian base-line population dynamics data from all river valleys of Garhwal Division in Uttarakhand in partnership with Forest department. 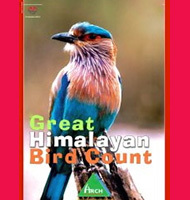 More than 1400 birdwatchers, dual students & conservation participated from across the country now including overseas. If you would like to participate or would like to donate please contact Prateek Panwar.